In the U.S., coloured toilet paper to match one's bathroom décor was all the rage in the mid-20th century, with the popularity peaking in the 1970s and then gradually waning until today, when, outside of gag-shops, you'd be hard-pressed to find a roll of coloured toilet paper. So why is this the case? There are several reasons, but one of the primary reasons toilet paper is white is the same reason most toilets are, simply that white toilet paper looks cleaner than the natural brown-ish colour the paper is before it's bleached. 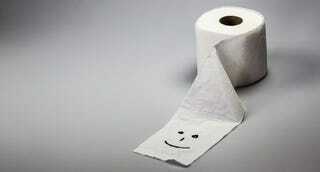 If toilet paper was the original brown hue, on a purely aesthetic level, would you use it? Or, perhaps more aptly, would you prefer it over the white variety? The consensus among toilet paper makers, like Kimberly-Clark who rang in on this issue, is that people consistently choose the white. One can only assume they've done extensive marketing studies to back that notion up, but even without access to those studies, it makes intuitive sense. That said, there are other factors at play as well. For starters, white isn't just an aesthetic choice, the white colour of toilet paper is usually achieved by bleaching the paper and this can make the paper much softer. Why? The bleaching process can be used to remove lignin, a polymer in wood that to some extent functions as a "glue" to hold the fibers together and makes the tree more rigid. As Dr. Hou-Min Chang of N.C. State University in Raleigh said, "Without lignin, a tree could only grow to about 6 ft. tall." Besides the added softness, removing lignin also adds a significant amount of shelf-life to the paper. For example if you've ever seen an old newspaper, you may notice that the paper starts to yellow as it ages; this yellowing is due to the presence of lignin in the newspaper. Obviously toilet paper that yellows over time, especially unevenly, isn't going to fly off the shelves. So that's partially why many toilet paper manufacturers bleach the toilet paper in the first place, but why don't they still colour it in many countries? There are a variety of reasons ranging from environmental impact of the dyes; potential for irritating certain people's skin, along with other negative health factors; and increased time of decomposition of the toilet paper, which is particularly a problem when using a septic system. Of course, things like environmental impact and potential health issues never stopped them from bleaching the TP in the first place, or adding many other chemicals to increase desirable attributes of toilet paper, which have many of the same drawbacks. It also hasn't stopped companies from adding such dyes to other product if it will increase sales, despite any negative impact. So while those are definitely factors in favour of leaving out the dyes, the primary reason here probably has more to do with the extra cost. To make up for this, they'd need to charge a little more for the dyed version. If this would have the potential to increase sales, they'd no doubt start making coloured toilet paper tomorrow. But as people today already generally prefer the white, the extra expense probably isn't going to get customers to buy more, unless they used some pretty clever marketing. But even then for a product like this, it would be a stretch unless it really was a superior product compared to the white version. So add it all up, and there's not enough incentive for the toilet paper makers to manufacture such an alternative to the now standard white variety. Approximately 10 million trees per year are used to make the world's supply of toilet paper. People in the United States on average use approximately 50% more toilet paper per person than other Western nations, primarily due to the reluctance of Americans to adopt water washing systems like bidets. Due to environmental concerns, not all manufacturers use the same bleaching process. For example,Seventh Generation claims that lignin isn't a problem for them since their product is created from 100% recycled products. That said, they still have to whiten the toilet paper a bit to make it more uniformly coloured. They whiten their toilet paper using hydrogen peroxide and sodium hydrosulfate, rather than the less environmentally friendly chlorine that many other manufacturers use. Karl Smallwood writes for the wildly popular interesting fact website TodayIFoundOut.com. To subscribe to Today I Found Out's "Daily Knowledge" newsletter,click here or like them on Facebook here. This post has been republished with permission from TodayIFoundOut.com. Image by Joseph.